These wheels bring bling bling to a whole new level. 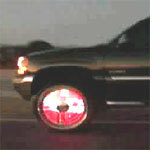 Pimp Star wheels allow you to define a graphic image to display on your spinning wheels while your vehicle is moving. With the package comes software which allow you to change the image anytime you want, and even define a few images to show in slideshow mode. Ridiculous, I don’t even want to image how much these wheels cost. This is even more over the top than LCD screen headlights. But there’s market demand in the US, like the rich rapper stereotypes who drive Hummers.